[By Nick, limited edition for July-Sept 2014] Time to extend my Turkey Hill sampling lead against Dubba with a double take of a couple new limited batch flavors. Both are from lines I've never tried before. I just covered their light Butter Pecan, now onto the raspberry! 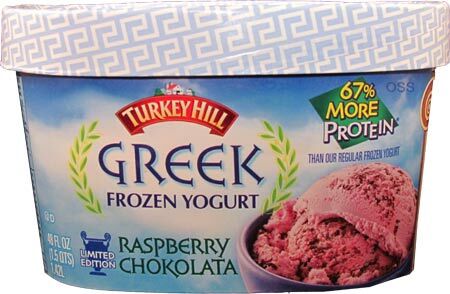 Ben & Jerry's Raspberry Fudge Chunk is easily my favorite greek flavor they offer so I have high hopes here. 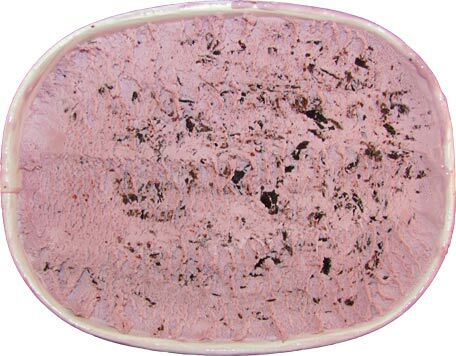 This one actually looks a lot like Talenti's Black Raspberry Chocolate Chip and the taste isn't too far off either. ‎While it's not as woodsy as Dubba would put it, it does have a very natural flavor to it. There’s a light tartness to the flavor but nothing strong or unappealing. The chocolate slivers are very similar to the ones in Talenti's raspberry in taste and size as well. The main difference between the two is the texture. The greek froyo is thicker but not quite as smooth as Talenti. If you haven't realized it yet, this is basically the love child of Ben & Jerry's and Taleni's flavors. The only problem is I prefer Ben & Jerry's flavor more than Turkey Hill's. While I can appreciate the naturalness, I’d rather have that raspberry filled chocolate quality you get with Ben & Jerry's. That said, for my first greek froyo from Turkey Hill, I'm pretty impressed. I'm looking forward to their sea salt caramel truffle flavor that's due out later this year now.